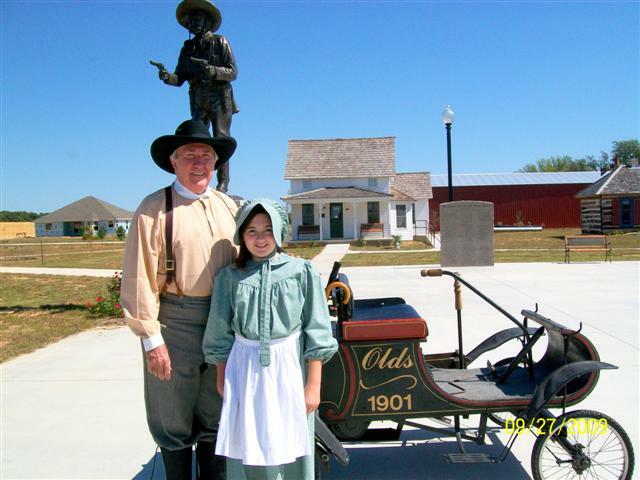 The Oklahoma Territorial Plaza and the Cimarron Starlite Cruisers sincerely appreciate the generous donation of this 1901 Oldsmobile Replica by Mr. Elvis Howell of Stillwater to Bud's Old Station for visitors to enjoy for years to come. 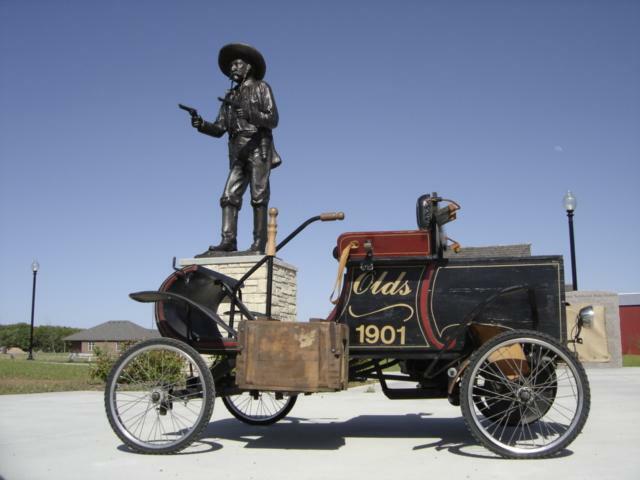 See the 1901 Olds and other pieces of history located in the Oklahoma Territorial Plaza in beautiful Perkins Oklahoma USA! Ransom E. Olds was born to Sarah Olds on June 3, 1864 in Geneva, Ohio. He was the son of a blacksmith named Pliny F. Olds, who eventually moved his small family to Lansing, Michigan in 1880. 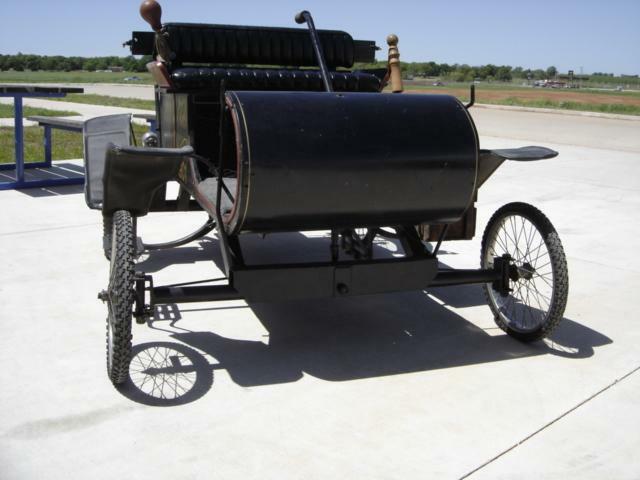 Ransom E. traveled to many technical fairs and was aware of the early gasoline engine designs of Daimler and Benz. These engines functioned on the four-stroke (Otto) cycle, on which Ransom began working himself. In 1895 he applied for and received a patent for his "vapor engine." The following year he mated one of these engines to a tiller-steering four-wheel carriage and demonstrated it for a Lansing newspaper, only weeks before Henry Ford demonstrated his original "quadricycle." Ransom spent his time doing what he loved most and kept building motorized vehicles, including electrics. 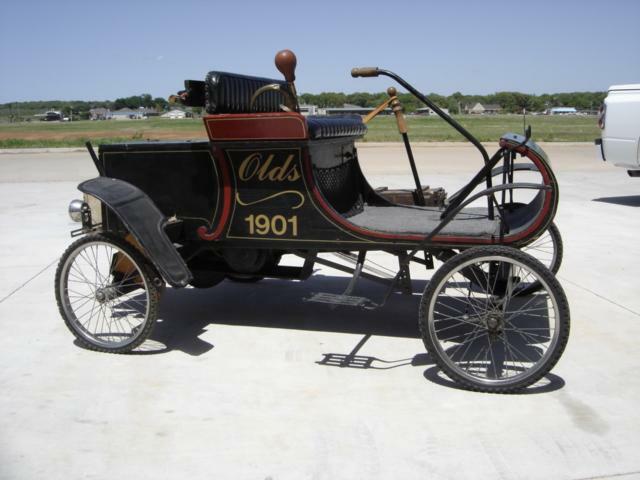 It was in 1900 that the first Oldsmobile was built, the name having been suggested by an employee of the company. In 1901 advertisements for the Oldsmobile Curved Dash Runabout appeared. At a selling price of $600, Ransom and his company had orders for over 300. A fire at the plant necessitated a relocated production facility and production was unable to keep up with orders. Engines, therefore, had to be purchased from the Dodge brothers, so Oldsmobile became the first auto company to "source" components. 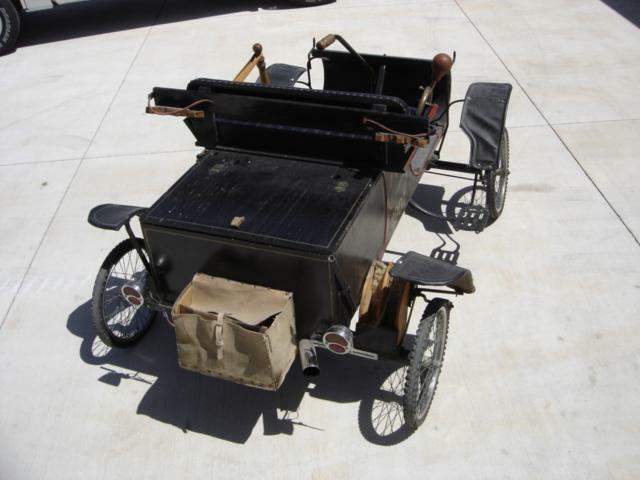 The Curved Dash was a wooden carriage built on top of tubular steel axles. A main leaf spring linked the front and rear axles on each side. Steering was done with a center tiller and braking was done by a pedal that caused a steel band to clamp around a cast-iron flange in the planetary transmission. Since the transmission was coupled to the drive chain, any failure there meant no braking. The transmission had reverse gearing and a high-speed clutch and the wheels were wood spoke on which tires were mounted. Thank you Elvis, for your generous donation! What the Curved Dash had going for it was reliability. Olds hired Roy Chapin to drive one form Lansing to the New York Auto Show in 1901 and he made it, making the Oldsmobile an instant national success. Oldsmobile thus insured its place in the automobile industry and Ransom became the "father" of the U.S. auto industry. 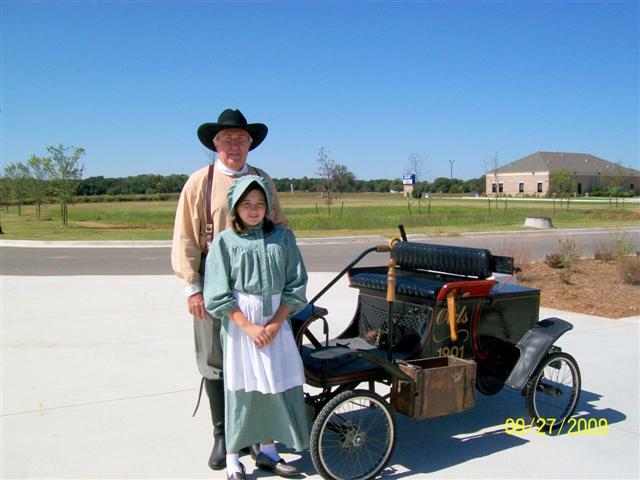 The Cimarron Starlite Cruisers thanks the Second Chance Garage for contributing the history for this story of the 1901 Olds.